Depending on the Eimeria species, the coccidian lifecycle takes approximately five to eight days to complete. Unsporulated oocysts are shed in the feces in the litter. Oocysts sporulate (become infective) in the presence of adequate moisture, oxygen and temperature. Oocysts are extremely environmentally resistant and can survive up to one year in dry, cool environments. Sporulated oocysts, containing four sporocysts that each contain two infective sporozoites, are ingested by the birds from ground and litter pecking. 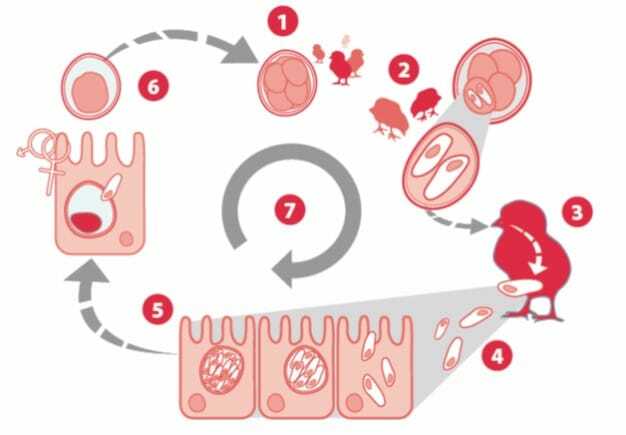 Sporocysts and then sporozoites are released in the gut from the sporulated oocyst by excystation, a process facilitated by the physical grinding effect and the presence of digestive enzymes and bile salts. The sporozoites penetrate the gut cells to initiate development of asexual intracellular schizonts. Schizonts produce large numbers of a second invasive stage, called merozoites that penetrate other gut cells to produce a further generation of schizonts. The number of asexual generations varies from two to four depending on the species of coccidia. Asexual multiplication results in an exponential increase in parasite numbers. Following the asexual lifecycle, a sexual lifecycle begins during which male and female gametes form. The male and female gametes fuse to form a zygote which develops into an immature, unsporulated oocyst that is shed onto the litter in the feces. With each successive cycle, the number of oocysts in the environment increases. Unless immunity has developed or an anticoccidial is used, when the environmental conditions are favourable for sporulation leading to a built-up threat, the naive or semi-naive birds will not be able to cope with this sudden, massive exposure in the number of infective sporulated oocysts.